Visit a true Vermont Country Inn, offering a warm and welcoming stay. 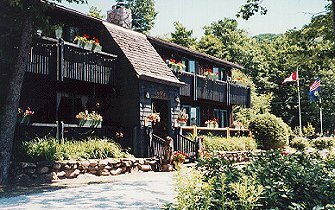 Located 2,000 feet above the valley floor, the Black Bear Inn is nestled in the heart of the Green Mountains with fabulous views and blaze of Fall colors that highlight our mountain vistas. Easily accessible from 1-89 and only 20 minutes from Vermont's largest city (Burlington). Our cozy Country Inn features twenty-four individually decorated rooms and suites, all with baths, showers, color TV's, phones, beautiful, warm, hand-made quilts, and many featuring flowering balconies and Vermont stoves or fireplaces. Our warm summer days and cool evenings make for a perfect day of sightseeing, antiqueing, horseback riding, mountain biking, hiking, fly fishing, or taking a dip in our heated outdoor pool. You may even want to just soak your body by relaxing in one of our private hot tubs located in the woods behind the Inn. With the seasonal changes, the Bed and Breakfast takes on a different character.. from being the only New England slop-sided ski-in/ski-out Inn accommodating both Alpine and cross country skiers, with over 45 downhill trails and over 100 km of finely groomed scenic trails. Bolton Valley Ski Resort wraps around the Inn and offers spectacular skiing and summer activities for every member of the family. The Inn's restaurant, under the watchful eye of the innkeeper/owner Ken Richardson (Culinary Institute of America graduate) ensures the guests' meals and dining experiences are enjoyable and memorable. Our kitchen prepares freshly baked bread/rolls, desserts and sweets daily under the direction of our Executive Chef, while our menu is changed daily to stimulate the senses and to challenge our guests' gourmet palate. After dinner, sit back and enjoy a cocktail or our fresh spiced apple cider next to our massive roaring fireplace, and reflect on what a truly relaxing vacation can be when staying at the Black Bear Inn. This and other Bolton Valley Bed and Breakfast Inns can be found here in The Register.